Home Uncategorized Is There Buried Treasure in Downtown Los Angeles? 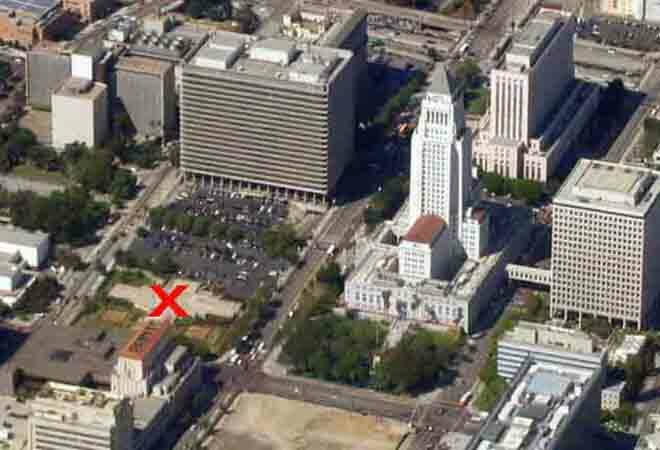 Is There Buried Treasure in Downtown Los Angeles? The site of a long-demolished building site at 1st and Broadway is being dug up this month for an expansion of Grand Park. The corner was home to the Los Angeles Times building when it was bombed in 1910, and later to an art deco tower that housed California state offices. That structure was damaged in the 1971 Sylmar earthquake so artwork and other WPA-era treasures were stored in the basement, which was retained when the building came down in 1974. Concrete and marble rubble languished there for 40 years until the bulldozers moved in a few weeks ago. I alerted Councilman Jose Huizar’s office to old newspaper reports of buried treasure and they assure me that nothing remains. I’ve talked to others in the city (Councilman Tom LaBonge offered to spelunk down there himself) and made contact with the state, but the whereabouts of the chandeliers, paneling, and “art nouveau décor” hidden below remain unknown. Flickr user Hunter DTLA went exploring in the exposed basement recently and it looks pretty empty. Where did the treasures go? “X” Marks the spot.